For these tests the FSA3157 has been used with a fundamental frequency squarer based on the 74AC04 in stead of the divide by two 74AC74M squarer used in the switch tests. 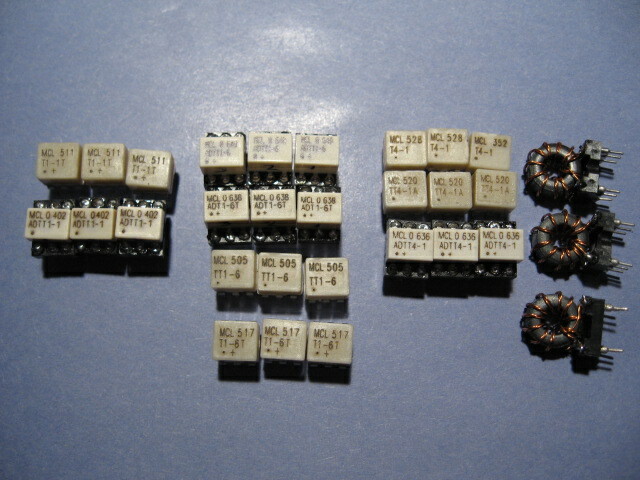 It is interesting to see how the Minicircuits 1:4 and 1:1 transformers used in the H-Mode mixer behave with respect to IMD. In this test 2 cascaded transformers are used and the IIP3 is measured while going from 50 to 200 and back to 50 ohms. All transformers do > +40dBm on all bands (almost), but the best transformer in this test seems to be the ADTT4-1. Things are more complicated when the transformers are applied in the H-Mode mixer as it turned out. All these transformers are tested with the FSA3157 mixer.